The Black Library was kind enough to send me some stuff to review, including the audio drama, Asurmen: The Darker Road by Gav Thorpe. I haven't read the Asurmen novel, yet I still really enjoyed this audio drama as the Phoenix Lord attempts to secure the future of the Ulthwé Craftworld. If you haven't listened to any of the Black Library audio dramas yet, I highly recommend them. They aren't like your typical audio book, but more like a movie with only the sound turned on. There are a bunch of different voice actors, sounds effects, and music to accompany the story. Right off the bat I was impressed with the voice work on this one. Previously I had listened to a few different audio dramas featuring Space Marines as well as the AoS ones and they did a good job of making the Eldar feel distinctly alien. They only sound this way when they are wearing their helmets, but it really adds to the effect. Asurmen's voice is distorted and echoey, making him sound very un-human like. The story takes place some unspecified time before the Horus Heresy, with Asurmen returning to Ulthwé. Like I already mentioned, I haven't read the full Asurmen: Hand of Asuryan novel, so I don't know where this fits into the timeline on that, but it stands well on its own. Once aboard the craftworld he is greeted by a Dire Avenger Exarch, Dolkhiriath, a former student of his, as well as a Farseer, Shar-telion, and a much younger Eldrad Ulthran, who is not yet in the position of power we are familiar from him. Shar-telion plans to visit a crone world within the Eye of Terror to seek guidance from a figure known only as The Oracle, whom she hopes to gain knowledge on what course to take to best secure the future of her craftworld. Asurmen agrees to help them and joins the trio as well as a warhost of Eldar as they journey to the surface of the planet. It's fairly interesting to hear about how this former Eldar planet has fared since the Eye opened up engulfing it in the Warp. All of the Eldar who died during The Fall still litter the streets of their cities, and the webway is visible in sky above the planet, fractured and exposed. Once they set off on finding The Oracle proper the story starts taking on a tone similar to a Greek myth of old. They find themselves in an extremely peculiar situation, with floating bridges and optical illusions. All of this seems fitting for the mystical Eldar, but even they are thrown off by how odd everything is, which I really enjoyed. It made them feel a little but more relatable, knowing that even they can be phased by the effects of the Warp. The rest of the story has them facing a series of tests as they try and find the Oracle within the twisting, crazy labyrinth. Like I said, it would feel right at home with a bunch of greeks navigating the tests of the Olympian gods. I don't want to give away any more of the story, but I really enjoyed it and it works perfectly as a small contained story. Out of all of the secondary characters, Dolkhiriath interests me the most. He is an Eldar lost in the path of war, unable, or unwilling to divert from it. He best shows the dangers of the teachings of Asurmen amongst the volatile Eldar. The music on this was a little different then what I expected as well. It had more of a real sci-fi feel to it then we are used to with other 40k music which I found pretty fitting for the Eldar. They have always been more advanced then the humans, so it only makes sense that their music would sound more advanced as well. It's a refreshing change of pace to hear something a little different in the 40k setting. There were only a few things that drew me out of the story a bit. The voice actor they had playing Eldrad is someone they have used for Space Marines and Stormcast in the past, so in my mind it seemed a little too "strong" for a Farseer. The other was the voice of Asurmen. It took me awhile to notice due to the distortion they put it through for the helmet effect, but it's the same voice actor they had playing Arkhan the Black in the AoS audios. His voice is very distinct, and once I noticed who it was I just kept thinking of Arkhan. Both of these issues are super minor, and more due to baggage I brought with me than anything else. If you are not as familiar with the other Black Library audio dramas this won't be an issue for you at all. 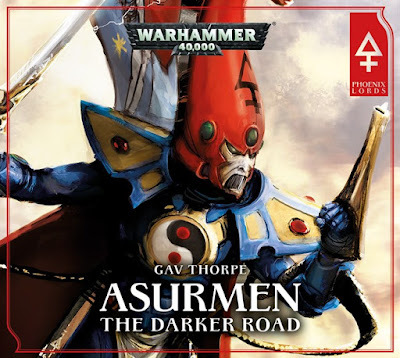 I really enjoyed Asurmen: The Darker Road and would definitely like to listen to more Eldar centric audio dramas in the future. It's probably something I wouldn't have thought of listening to on my own, just because the Eldar have never been an attention grabber for me personally, but I'm really glad I listened to it. If you're a fan of the Eldar then I definitely recommend giving this a listen, and it's a great listen for any 40k fans in general. Like I said, the audio dramas really are much more cinematic than normal audio books, so if you're unsure about audio dramas in general, give them a shot, you wont regret it.